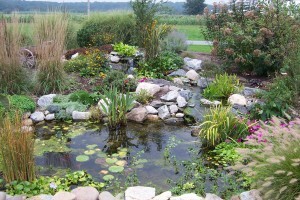 Adding a water feature to a State College, PA, landscape would bring peace and positive energy to homeowners. They can easily imagine forgetting all about everyday problems while they indulge in the sound of water movement and enjoy the beauty that a water feature would bring to their backyard. A new water garden or waterfall (or even both) go beyond adding to the aesthetics—they also encourage relaxation and add simple pleasures within reach. Water features never fail to enhance the tranquility and distinctiveness of their surroundings. They can be constructed in various designs, and from various materials, to achieve a dynamic finished product filled with its own unique character. The materials you select for a particular water feature will depend on its desired appearance, ideal weight, and how durable it needs to be to survive the Harrisburg, PA, climate. It's Spring Start-up Time for your Pond! It seems like Spring has finally arrived in Central PA . Ideally, spring clean out and start up for your water garden take place before the water temperature reaches 55 degree, but if you haven't done it yet, it's not too late! Here is a quick Aquascape video showing you what you need to know to get your pond up and running, and looking good going into summer. Enjoy!